•	Kids aged 17 and below entering KidZania Manila must be accompanied by an adult (aged 18 and above) during the check-in process at the check-in counter. •	Kids aged 8 and above are allowed to explore KidZania Manila on their own after being checked in by an adult. On arrival, both adult and kid will receive a security RFID bracelet. The accompanying adult is required to fill up a Universal Adult Form (UAF). No child will be able to exit KidZania without being matched to the adult who was present at check-in and appears as signatory of the UAF. •	Although KidZania is for kids, we require at least one full-paying adult to accompany a kid below eight (8) years old at all times when inside the play city. •	Adults entering KidZania Manila must be accompanied by at least one (1) toddler (below 4 years of age) or kid (aged 4 -17 years). •	Kids are the priority of KidZania Manila. Thus, for optimal Visitor experience inside the play city, each kid can be accompanied by no more than five (5) full-paying adults (aged 18 and above). •	Kids aged below 4 years old are considered toddlers and may only play at toddler designated areas (non-roleplay activities), namely the Kindergarten, RightZKeepers’ House and Bookstore, together with one (1) full-paying adult. KidZania Manila check-in counters open an hour before the start of each shift. It is recommended that Visitors arrive at least 30 minutes before the start of the shift. To maximize the experience of the children, Visitors are encouraged to enter the play city at least two (2) hours before the end of the shift. Visitors who entered the play city with less than two (2) hours of play time are still required to settle the full ticket amount and sign a corresponding waiver. For PWDs or CWDs, kindly purchase your discounted tickets from KidZania Manila counters and present your IDs. Maximum of 15 tickets per transaction. Download and save or print your e-tickets prior to entry to KidZania Manila. For security and safety, it is mandatory that all Visitors wear their security bracelets at all times. KidZania Manila may require from its Visitors proof of age before they are allowed entry. This includes any valid ID, including a government-issued ID, school ID and NSO-certified birth certificate. Please read our KidZania Manila City Codes http://manila.kidzania.com/en-ph/t/city-codes so you are prepared to enjoy your visit to the play city. Prior to entry to KidZania Manila, the parent/legal guardian must give written consent to take pictures and/or videotape of his/her kid Visitor while inside KidZania Manila. KidZania Manila reserves the right to use these pictures and/or videotapes exclusively for promotional and/or advertising purposes. KidZania is an indoor play city where kids can have fun exploring and learning the adult world! Kids decide for themselves where to work in over 70 establishments so they earn money called kidZos. They can choose to open their bank account to save their kidZos, or use it to pay for training and purchase item. Experience learning through play in KidZania Manila – one of the fastest growing educational entertainment brands with more than 20 facilities all over the world from Mexico to Dubai to Tokyo. 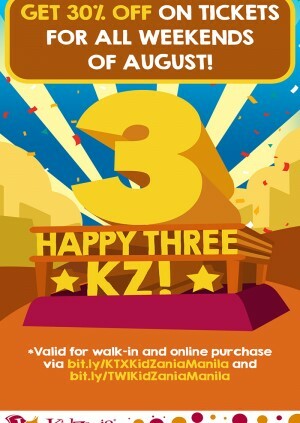 Visit the KidZania Manila website to know more.